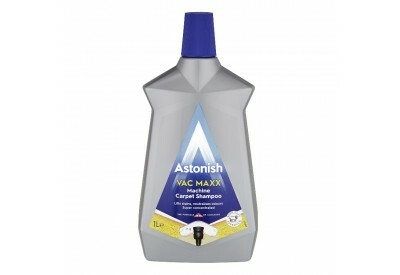 Astonish Vac Maxx Machine Carpet Shampoo is super concentrated, deodorises and freshens and is phosphate free. Specially formulated fo machine use on large carpeted areas. The powerful cleaning action penetrates deep into fibres to loosen and lift away tough dirt and stains whilst gently caring for your carpet. The deep cleaning action neutralises unpleasant odours to leave a fesh scent. Compatible for use with leading carpet cleaning machines.